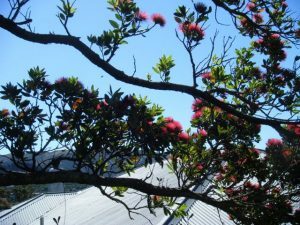 It’s warm summer weather here in Wellington, with the pōhutukawa trees (also known as the Kiwi Christmas trees) in full bloom. I don’t expect to be posting as regularly for the next couple of months—I’ve been working too hard, and want to relax a bit and enjoy the fine weather while it lasts. So, for now, I wish everyone reading my blog a safe and happy holiday season, whatever holiday it is you celebrate.